PARTICULARLY for my new readers, this writing gives a very broad picture of what I feel the Spirit is saying to the Church today. I am filled with great hope, because this present storm will not last. At the same time, I feel the Lord continually urging me on (despite my protests) to prepare us for the realities which we face. It is not a time for fear, but for strengthening; not a time for despair, but preparation for a victorious battle. The Christian attitude is twofold: one that recognizes and discerns the struggle, but always hopes in the victory attained through faith, even in suffering. That is not fluffy optimism, but the fruit of those who live as priests, prophets, and kings, participating in the life, passion, and resurrection of Jesus Christ. It has been nearly a year since I met with a team of other Christians and Fr. Kyle Dave of Louisiana. From those days, Fr. Kyle and I unexpectedly received strong prophetic words and impressions from the Lord which we eventually wrote in what is called The Petals. The winds of change have begun to blow again. With that, the image of a hurricane came to mind. The sense I had was that a great storm was beginning to blow; that this summer was the calm before the storm. But now, that which we have seen coming for a long time, has finally arrived—brought about by our own sinfulness. But more so, our pride and refusal to repent. I cannot express adequately how sad Jesus is. I have had brief interior glimpses of His sorrow, felt it in my soul, and can say, Love is being crucified again. But Love will not let go. And so, a spiritual hurricane is approaching, a storm to bring the entire world to the knowledge of God. It is a storm of Mercy. It is a storm of Hope. But it will also be a storm of Purification. 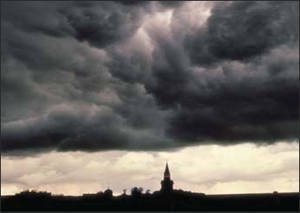 As I have written previously, God is calling us to “Prepare!” For this storm will have thunder and lightning as well. What that means, we can only speculate. But if you look upon the horizons of nature and human nature, you will already see the billowing black clouds of what is coming, beckoned by our own blindness and rebellion. When I saw in my mind this coming whirlwind, it was the eye of the hurricane that caught my attention. I believe at the height of the coming storm—a time of great chaos and confusion—the eye will pass over humanity. Suddenly, there will be a great calm; the sky will open up, and we will see the Son beaming down upon us. His rays of Mercy will illuminate our hearts, and we will all see ourselves the way God sees us. It will be a warning as we see our souls in their true condition. It will be more than a “wake-up call”. This illumination, this break in the storm, will no doubt produce a tremendous time of conversion and repentance. A day of Mercy, a great day of Mercy! …but it will also serve to sift, to further separate those who have put their faith and trust in Jesus from those who will refuse to bend their knee to the King. And then the Storm will begin again. It appears the Church is heading toward a great purification at least, primarily through persecution. It is clear from the number of public scandals and open rebellion among religious and clergy in particular, that even now the Church is passing through a necessary but humiliating purgation. Weeds have grown among the wheat, and the time is approaching when they will be more and more separated and the grain will be harvested. Indeed, the separating has already begun. But for relativists, it is no longer enough that they disagree with orthodox and historical practice. Their disordered standards are now being legislated with penalties for dissent. From fining marriage commissioners for not marrying gays in Canada, to penalizing medical professionals who won’t participate in abortions in America, to prosecuting families who homeschool in Germany, these are the first whirlwinds of persecution rapidly overturning moral order. Spain, Britain, Canada, and other countries have already moved toward punishing “thought crime”: expressing an opinion differing from the state-sanctioned “morality”. The United Kingdom now has a police “Minorities Support Unit” to arrest those who oppose homosexuality. In Canada, non-elected “Humans Rights Tribunals” have the power to penalize anyone they deem guilty of “hate crime.” The U.K. plans to ban from their borders those whom they call “preachers of hate.” A Brazilian pastor was recently censored and fined for making “homophobic” remarks in a book. In many nations, agenda driven judges are continuing to “read into” constitutional law, creating a “new religion” as the “high priests” of modernism. However, politicians themselves are now beginning to lead the way with legislation which is directly opposed to God’s order, all the while freedom of speech in opposition to these “laws” is vanishing. “…speaking in defense of the life and the rights of the family, is becoming in some societies a type of crime against the State, a form of disobedience to the Government…” and warned that someday the Church may be brought “in front of some international Court”. —Vatican City, June 28, 2006; Ibid. I have felt compelled in my own preaching during the past three years to warn about this spiritual deception which has already blinded not only the worldly, but also many “nice” people. See The Fourth Petal: The Restrainer regarding this deception. Going back to that time of consecration, this is what I seemed to “see” all at once while praying before the Blessed Sacrament that day. The “parallel communities,” on the other hand, would reflect many of the values of the Christian communities—fair sharing of resources, a form of spirituality and prayer, like-mindedness, and social interaction made possible (or forced into being) by the preceding purifications which would compel people to draw together. The difference would be this: the parallel communities would be based on a new religious idealism, built on the footings of moral relativism and structured by New Age and Gnostic philosophies. AND, these communities would also have food and the means for comfortable survival. The temptation for Christians to cross-over will be so great… that we will see families split, fathers turned against sons, daughters against mothers, families against families (cf. Mark 13:12). Many will be deceived because the new communities will contain many of the ideals of Christian community (cf. Acts 2:44-45), and yet, they will be empty, godless, evil structures, shining in a false light, held together by fear more than by love, and fortified with easy access to the necessities of life. People will be seduced by the ideal—but swallowed by the falsehood. Even though people will have by now heard the revelation in Scripture regarding the dangers of a coming world religion, the deception will be so convincing that many will believe Catholicism to be that “evil” world religion instead. Putting to death Christians will become a justifiable “act of self-defence” in the name of “peace and security”. Confusion will be present; all will be tested; but the faithful remnant will prevail. But they will be smaller in number—a remnant of what was. The Church will be reduced in its dimensions, it will be necessary to start again. However, from this test a Church would emerge that will have been strengthened by the process of simplification it experienced, by its renewed capacity to look within itself… the Church will be numerically reduced. —God and the World, 2001; Peter Seewald, interview with Cardinal Joseph Ratzinger. Did Jesus foretell the persecution of the Church so as to fill us with terror? Or did He warn the Apostles of these things so that an inner light would guide Christians through the darkness of the coming storm? So that they would prepare and live now as pilgrims in a tran sitory world? But we will love in return, and by our love, win the souls of our persecutors. And in the end, Our Lady of Fatima’s promise of peace will come… peace will come. We will never be abandoned in this journey, no matter what it brings. What has been said in these five “Trumpets of Warning” are what has been laid on my heart, and the hearts of many believers throughout the world. We cannot say when, nor even for sure if these things will come to pass in our time. God’s Mercy is fluid, and His wisdom is beyond our understanding. To Him a minute is a day, a day a month, a month a century. Things could go on yet for a very long time. But this is not an excuse to fall asleep! Much depends on our response to these warnings. Christ promised to remain with us “to the end of time.” Through persecution, hardship, and every tribulation, He will be there. You should find such comfort in these words! This is not a distant, generalized patronization! Jesus will be there, right there, near as your breath, no matter how difficult the days may become. It will be a supernatural grace, sealed in those who choose Him. Who choose eternal life. I hold each of you in my heart and prayers, and ask your prayers. As for me and my family, we shall serve the Lord! Posted in HOME, TRUMPETS OF WARNING!. ← I Will Keep You Safe!